As necessary and significant as teachers know curriculum is to our work and calling: you must also realize that we will throw it all under the bus if it means assisting a child. We will put it all on the back burner if our students need us to teach them life lessons that will help them be better friends, better citizens, better people. The one thing students really need on any given day may not actually be contained in the words written down on paper -- those goals for the day typed out on a lesson plan or scrawled out on paper. No, it might not be the planned numeracy lesson or literacy centre that meets them where they are at. Not even the science activity or health endeavour designed to maximize student achievement that can bait their appetite for learning and knowledge. Actually, these curricular outcomes are not always the lessons or insights students primarily need on any given day. Believe it or not, on some days, these lofty ambitions and worthwhile pursuits are the last thing needed. As teachers, we might find ourselves in the middle of an amazingly, important math lesson about addition. And in the moment, it just might seem like the most significant lesson needing to be taught on the face of the earth. Because of course, we all need to learn addition. And of course we all need to be able to find totals, sums and answers to our questions. To be fair, addition seems pretty essential when you are in the moment. Vital, really. Especially when you remember all the rest of the outcomes in the curriculum guide that are left to cover in a school year. And particularly when you remember how far you still have to go to achieve those curriculum goals -- when you remember how far you are from meeting your grade level benchmarks. What students need is someone to reinforce that life is about more than learning letter names and sounds, about more than print on a page. In moments like these, math (or any other content area) can seem all important. It can seem critical and urgent. Imperative. My students need something... and it is not a math lesson. In that single instant, a light-bulb is lit. Illuminated with the very idea that what these students need is a teacher to teach them that learning is about more than understanding math and numbers, as crucial as that is to functional living. They need someone to show them that life is about more than crunching a bunch of random numbers so that they evenly balance and total correctly. What students need is someone to reinforce that life is about more than learning letter names and sounds, about more than print on a page. And it's certainly about more than sheets that need to be filled up with answers and reports that need to be filed. It is about more than being able to perform on cue and make the mark. The lesson stops being about the book and shifts to being about the heart. Learning is really all about people doing the learning, as it essentially involves people's minds, hearts and souls. And when little and big people are not able to focus and concentrate because they are too busy thinking about the fact that their bellies are hungry. Or when people are not able to focus because they are too distracted with the fight that happened in the morning before the bus picked them up for school. And if people are not able to attend to the lesson at hand because they were just involved in a conflict at recess or a disagreement on the playground or a fight in the dramatic play centre: then the lesson stops being about the book and shifts to being about the heart. You see, teachers must intuitively know how to move the lesson from one way of thinking to another. We are jugglers of our craft. This is the balancing act we are compelled to be part of when we accept our calling. We understand that teaching the book, the method, the strategy, the technique -- as important as these are and necessary to our functioning in society: more urgent is our need to relate and understand ourselves and the others with whom we co-exist. More necessary is the lesson about character, about perseverance, about caring, about getting along, about patience, about restraint, about self-control, about gentleness. More important is the lesson about forgiveness -- about acceptance and integrity. More crucial is the lesson about tolerance and understanding, the lesson about remorse and honesty. The most important lesson we can teach students is that what really matters is them. 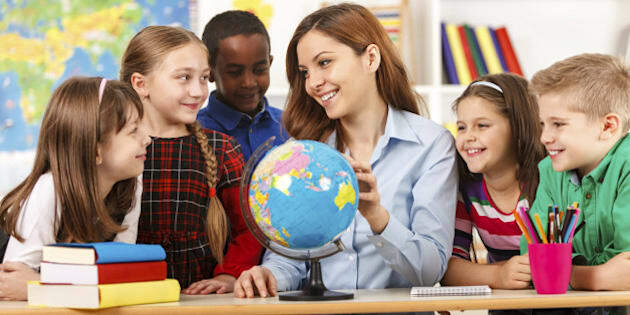 And as necessary and significant as teachers know curriculum is to our work and calling: you must also realize that we will throw it all under the bus if it means assisting in the heart-life of a child. We will put it all on the back burner if our students need us to teach them life lessons that will help them be better friends, better citizens, better people. Yes, we will stop the lesson if our kids require it. Because sometimes the most important lesson we can teach students is that what really matters is them. Our work as teachers is truly all about people with whom we've been entrusted.